The Peachy Keen Let's Face it Friday challenge this week was to evoke the feeling of "windy" "whimsy" or "flourish". 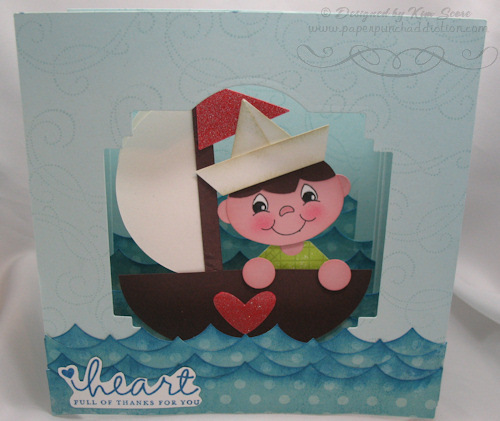 My card is completely literal as I created a little boy in a sail boat. 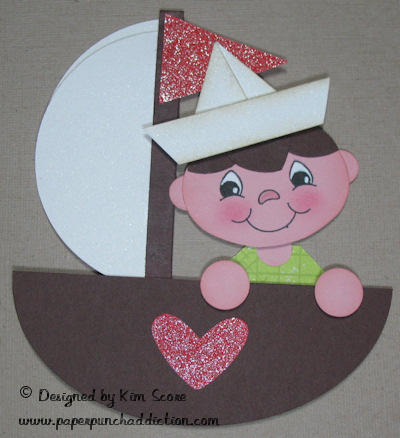 On my little sailor boy, I used the Peachy Keen PK-485 Snowmany Faces 1-1/8" face stamps. The other girls on the team created fantastic projects, so be sure to check them out at the challenge site HERE. The instructions for creating the sailor boy is below. 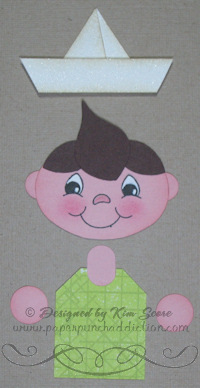 Please come back tomorrow for the step by step instructions for creating an Accordion Peeker card. It's hard to tell from the photo but this card has 4 layers inside with staggered waves which give it a deep 3-D look. For the hat brim trim the ends of the white strip as shown. Sponge the edges of hat pieces with crumb cake ink. Layer the 2 pennants as shown. Attach hat brim with dimensionals. Trim top off ornament. Stamp face with black. Add highlights to eyes with unibal gel pen. Use blender pen to add regal rose ink to nose. Stipple regal rose ink onto cheeks. Sponge edges of blushing bride pieces with blushing bride ink. Glue blossom petals onto head for hair. Glue ears onto head. Glue neck onto back of tag. Attach head to neck with dimensional. Attach hat to head with dimensionals. Cut chocolate chip circle in half for boat. 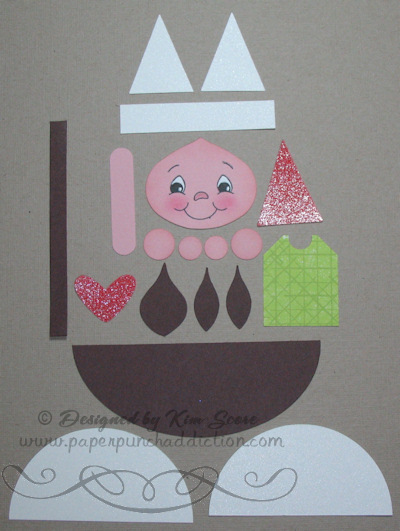 Fold strip of chocolate chip in half and glue together for sail post. Glue post onto boat. Cut white circle in half to create sails. Layer semicircles with dimensionals. Glue onto post. Glue flag onto post. Glue heart onto helm. 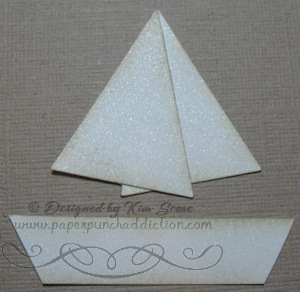 Attach sailor onto back of boat with dimensional. Attach hands with dimensionals. PLEASE COME BACK TOMORROW FOR THE STEP BY STEP TUTORIAL ON THE ACCORDION PEEKER CARD. You are amazing Kim. You never cease to astound me. I agree with Bron - being ex-Navy - I know a heap of sailors who would love this!!!! I just found this little guy Kim, and he is sooooooooooooooooo cute! I have now gone and bought a bunch of faces from Peachy Keen (what a great idea). Thank you so much for your inspiration, and for directing me to Peachy Keen!